Claremont Adult Soccer League is following the official FIFA "Laws of the Game"! 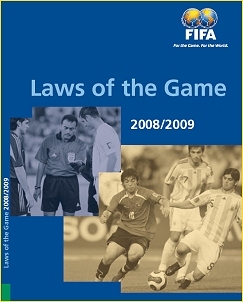 Click on the image to view and/or download FIFA Laws of the Game. Please note that file is over 2MB, so it could take some time to open it. b) Subs on any change of possession with referees consent (different from CASA). d) Second red card = 2 game suspension 3rd red card = possible suspension for rest of season. Fighting is cause for immediate suspension/ban from all league activities. * Incidents of "gross misconduct" will be reviewed by CASL Executive Committee for possible suspension beyond 1 game (initial red card offense). 1. Coach & Assistant Coach - Each team must have an assigned coach and assistant coach at each game. If no coach or assistant coach is noted on the roster sheet prior to start of the game, this could result in a forfeit. 2. Team Fee’s – The team fee is $1,350. CASL reserves the right to increase team fees if necessary to cover the expenses of maintaining the league. 3. Team fees are due by the 3rd week of the season. Any team not paid in full by week 3 will have to pay a penalty of $100. 4. Alcohol & Trash – No drinking alcoholic beverages at the fields/parks at any time. Any team found consuming alcoholic beverages at the field/parks will have 3 points deducted. The 2nd offense will result in forfeiting the rest of the season and possible expulsion from the league permanently. All teams are responsible for picking up their trash to keep the fields/parks clean. 1. Maximum players allowed on a team roster are 22. 2. Registration - Each player will sign a waiver form and must have a CASL player card. Any player not presenting his/her player card will not be able to play. If however, an entire team is without player cards, the referee shall verify player identifications through the player’s driver’s license. 3. Adding a Player – Within the first half of the season, any new player must have signed waiver and player card by the Wednesday prior to their first game, no exceptions. 4. Over 30 divisions – Each team is allowed 3 players between the ages of 21-30 years old on the roster. 5. Over 40 divisions – All players must be 40 yrs old or turn 40 within the calendar year. 6. Over 50 divisions – All players must be 50 yrs old or turn 50 within the calendar year. 7. All rosters will be final by the half way point of the season for each division. Once the season has started the last day to add players will be posted on the CASL website for all teams to see. 8. Player changes – Any player who changes teams will be ineligible for one scheduled game prior to playing with the new team. There will be no changes after the halfway point of the season. 9. Player Uniform and Equipment – Every player must wear a matching jersey with numeral. Shingaurds as mandated by FIFA are required for every player as well. 10. Over 50 divisions – Each team is allowed 4 players 48 or 49 years old. After start of Spring 2011 season all players must be 50 years old to play. 11. All rosters will be final by the 6th week of the season for each division. Once the season has started the last day to add players will be posted on the CASL website for all teams to see. 12. At no time during the start of the season can a player from any division play on two or more teams in the same division. 1. Game Length – Each game is 90 minutes. Two 45 minute half’s. 2. Team Captains – Each team must assign a captain with a captain’s armband. 3. Substitution – Unlimited substitution. Late check-in, player must give player card to referee before entering the game, no exceptions. 4. Referee – The referee is the sole decision-maker on the field. The judgment of the referees with the assistance of the linesmen, will guide the game. Only the captain may approach the referee, with the referee’s permission and in a respectful manner. 5. Other Situations – Any situation not included in CASL rules or the FIFA laws of the game will be resolved at a CASL review board meeting. 6. Any Team unable to field 7 or more players within 15 minutes of the scheduled start time will result in a forfeit. 1. Each referee must document detailed facts of all yellow cards, red cards or any incidents that are controversial to the best of their knowledge. Pending a possible review of any serious incidence and or red card disputes. 2. At conclusion of each game referee must hand game card to team manager or team captain only. Each team captain/manager must sign the match card and return to the referee even if there is challenge to the game outcome or incidence during the game. Each team captain/Manager has the ability to make comments pertaining to the match and or officiating on the back of the game card. 3. If any team refuses to sign match report at conclusion of game, team will forfeit the ability to protest game. 4. A player who receives a red card and participates in multiple divisions in same season will have to sit out the following week for all divisions the player participates in. However, players who receive red cards will be allowed to play in other divisions the same day due to the fact that the referee’s cannot monitor multiple fields and multiple divisions on game day. 1. Points – 3 points for a win, 1 point for a tie, 0 points for a loss. 2. If head to head does not determine the out come goal differential will be taking in consideration. 1. Illegal players – A team will automatically forfeit its game and an additional 3 points will be deducted from its point total if a team plays any player who is not already registered or has been suspended. Team managers are responsible for checking in late arrival players and making sure that all players are checked before starting of the second halve of the game any unchecked players is subject to forfeit of the game. 2. Any game that is stopped by the referee for any reason, prior to the final whistle (full time 90 minutes), will be reviewed by the CASL board to determine the final result of the game. 3. Any Team that leaves the field before full time is called by the referee for any reason will forfeit the game. Only the referee(s) can call the game early due to any unusual circumstances, such as fighting, unsportsmanlike like conduct, or bad weather, etc. 4. All players/spectators must be a minimum of 1 yard of the touch line. 5. Lifetime Ban – Any player, coach, manager or bench personnel who abuses a referee, threatens a referee, engages in fighting, or receives 3 red cards in one season may be banned from the CASL league for life, pending review by the CASL review board. 6. Team Captain – Only the team captain can engage in dialogue with referees at any time during the game. No exceptions allowed. 7. Disputes with referees, League officials or the CASL Board – No dispute or argument with the referee or linesman shall be allowed or with any League Officials. Any player, coach, manager or, bench personnel who argues with the referee, at the referee’s discretion, be cautioned (yellow card) immediately. If the individual pursues the argument they shall be sent off (red card) and removed for the field of play. This also applies to a teams fans. If a teams fans are being disruptive to the game the ref can give a verbal warning to the Team Manager and or Team Captain to get the fans under control. If fans continue to be disruptive to the game the referee can follow suit with Yellow and/or red cards forcing the team to remove a player from the field and play short one player. That player will also be suspended for an additional game. Also no Player is allowed to argue with any League Officials or any CASL Board Members. Disciplinary Action can be taken against a player who argues with any League Official or any CASL Board Member including game suspensions or banning from the league. 8. Yellow Card – Any player who receives 4 yellow cards in a season will receive a 1 game suspension. 9. Red Card – Any player who receives a red card will not participate in the remainder of the game and will be given a 1 game suspension at a minimum. Any serious red card incidence will be reviewed by the CASL review board to determine the level of suspension (could be multiple games) or termination. a 1 game suspension at a minimum. Any serious red card incidence will be reviewed by the CASL review board to determine the level of suspension (could be multiple games) or termination. 10. Red and yellow cards will carry over from league play to league cup. However, cards do not carry over from end of one season to the beginning of the next season. 11. Game protest “must” be noted by team captain or team manager on the match report & signed. The protest will then is evaluated by the CASL Board of Directors and determine if the result of the game stands or if further review is necessary. If further evaluation is necessary then the CASL review board will meet with the team captain or team manager, and the center referee to determine the outcome of the game. All protest will be reviewed on the Tuesday immediately following the Sunday game at 6:30pm at Round Table Pizza on the corner of Fruit St. and Foothill in La Verne. Once the CASL review board determines the outcome the decision is final. Other Situations – Any situation not included in CASL rules or the FIFA laws of the game will be resolved at a CASL review board meeting! During the game last Sunday a fight brook up between booth teams the board decision after reviewing the Referee report is as follow. The 2 teams will not get any points from their week 7 game. Plus booth teams will be panelized with 3 additional point’s deduction, due to the involvements of their players and spectator . Player Juan Pinto from Union Ocopilla is bane for life from playing in CASL. And both teams are now on probation, any problems, fighting, misconduct, from San Carlos or Union Ocopilla will result of immediate expulsions from playing in CASL. In February the CASL Board voted to give a life ban to a Union Ocopilla player,Salvador Adame for starting a fight. This last Sunday (Feb. 21st) a Galaxy FC player, while down on the ground, received a blatant, purposeful kick to the head from another Union Ocopilla player. We are not sure of the current condition of the Galaxy FC player but such behavior is not acceptable in our league. Union Ocopilla has a history of fielding under-age players and is well known for verbally abusing referees and opponents. At this juncture this team represents a safety concern for our league and them, and all players on their roster, are banned from CASL for 1 full season. The voting for this ban was unanimous and no hearings will be held. and possible bane of the whole team. We forfeited los Borrachos 40 on week 1 games for having open beer. we forfited Super guapos 50 game against Aria Fc on week 4 for under age player that is not on the team roster. we forfited Asturia fc 50 game against Aria fc on week 5 for using 2 under age players. we forfited Chivas 50 game against Aria fc on week 6 for using 1 under age player. we forfited Galaxy 55 game against Chivas 55 on week 6 for using 3 under age players. we forfited Super Guapos 50 game against Puma 50 on week 6 for not showing to the game.